When it comes to visiting the Hawaiian capital of Honolulu, hiking the Koko Crater Trail, also known as the Koko Head Stairs, has become a regular tradition for tourists. With 1,048 steps to the top, the trail follows the steep hill that rises 1,200 feet above Kawaii Kai and overlooks Hanauma Bay. The trail is estimated at one and a half miles round-trip from the parking area and is usually rated at a moderate to intermediate level. 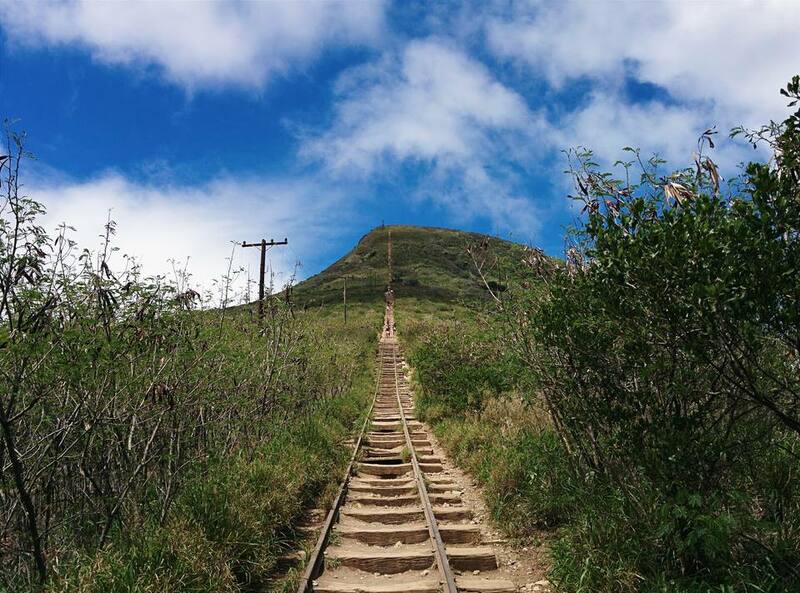 Koko Head is often called nature's Stairmaster, but humans helped the evolution of the incline by adding a railway during World War II in order to transport military personnel and supplies up to lookouts built at the top. Today, all that remains are remnants of the old lookouts and a trail lined with railroad ties. While there are many hikes in Hawaii to choose from, the hike up Koko Head Stairs is one of the quickest, easiest, and most enjoyable hikes on the islands. The stairs climb straight up the hillside, and the first 500 railroad ties are set at a moderate incline, but you should try to pace yourself as the second half of the trail becomes steeper for the ascent to the peak. At about this point, there is also a wooden bridge that you can either cross directly or take a path to the right that avoids the bridge if you're afraid of heights. After the bridge, the grade is considerably steeper. One tactic for conquering the stairs is to take 10 or 20 steps and then break for a minute or so (which also serves as a perfect opportunity to snap photos)—just make sure to step off the path so others can pass. Descending can prove to be somewhat challenging and taxing, especially on your knees. Taking it one step at a time and trying a side straddle down is one good strategy to avoid straining on the way down. Use whichever method provides a safe and comfortable descent, and be prepared to dodge sprinters as they come flying down the mountainside. Don't be surprised to encounter a vast cross-section of hiking abilities on this hike. You'll find avid trail runners who sprint up three times a week in under 20 minutes and visitors to the island who take it a few leisurely steps at a time. No matter what your style or level, the vistas are worth the workout. It's not everyone's cup of tea, but you may be surprised at how quickly you will want to adopt it as a new tradition. Though good footwear is recommended, you may see the occasional veteran hikers making the climb in slippers—it really depends on your experience and comfort level for what you should pack. In any case, you should also take precautions during inclement weather due to the railroad ties and steps becoming slippery when wet.